If you are missing one or more of your natural teeth, you may be a good candidate for dental implants. Secured directly into your jaw, these restorations provide a long-lasting solution to missing teeth and the accompanying oral health problems. Dr. Christian Len can evaluate your candidacy for dental implants at his White Rock, BC practice. Contact Dr. Christian Len to find out whether you might be able to enjoy the many benefits that dental implants have to offer. A dental implant is a threaded titanium post that is placed into the jawbone in place of a missing tooth (or teeth). 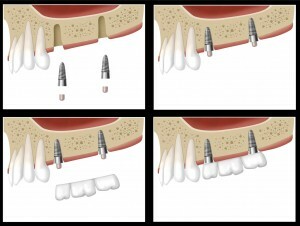 Once the implant has integrated (fused) to the bone, a crown (or cap) is placed on top of the implant. Dental implants can also be used to stabilize partial or complete dentures, which will significantly improve the fit of the dentures, as well as the function of the denture. Patients quite often will find they are better able to chew, speak, and function with a denture that is supported by dental implants. Another very important benefit of having a dental implant placed where teeth are missing is that it will help to maintain the level of bone in the area of the missing tooth. When a person loses a tooth, the bone in the area naturally starts to shrink and resorb. This can lead to multiple problems down the road, especially in the esthetic areas of the mouth. If an implant is placed, it will stimulate the bone, which helps to maintain the current bone height in the area. Whether implants are being used to replace a single missing tooth, multiple missing teeth, or to support a denture, they will provide stability and a more natural look and feel to the mouth and smile. Dental implants have the highest long-term success rate of ALL implants used in the human body. When you come in for your initial consultation, Dr. Len will complete a thorough evaluation of the existing structures of your bite and begin to create a personalized treatment plan. Our practice uses advanced imaging techniques such as 3D cone beam computed tomography (CBCT) scans to evaluate the available bone tissue and plan your surgery. This technology allows us to provide treatment with unparalleled precision. Dr. Christian Len also uses the cutting edge technology of a 360 Imaging Surgical Guide which allows him to virtually plan the positioning of the implant(s) on the 3D image provided from the CBCT scan. He then has a device, similar in size to the average nightguard or sports guard, which is used during the dental implant surgery to place the implant in the exact location where it had been treatment planned on the 3D computerized model generated from the CBCT 3D scan. Some patients may require a bone grafting procedure prior to their implant placement surgery in order to build up adequate bone tissue. We perform bone grafting using today’s most sophisticated techniques. On the day of your dental implant procedure, your doctor will perform your personalized treatment plan to precisely and accurately place the titanium posts in their optimal positions within your jawbone. Dr. Christian Len will create a small incision in the gum tissue to expose the underlying jawbone. The dental implant will then be surgically embedded into the bone, and the gums sutured closed to cover it. Dr. Len may place a temporary crown, bridge, or denture over the dental implant while the surgical site heals. For implants with traditional restorations, the titanium posts will be allowed to permanently integrate with the bone for a period of three to six months, with periodic check-up appointments so that we can monitor the process. When integration is complete, your permanent restoration will be attached to the titanium post with an abutment. Implants restore function and aesthetics to your smile, and are the only restorative option that protect against future bone loss. When tooth loss occurs, the jawbone will begin to atrophy because it is no longer receiving stimulation from the natural tooth root. Because a dental implant is embedded in the jaw, it supplies this stimulation, preventing bone atrophy. The best candidates for dental implants are missing one or more of their natural teeth, but are generally healthy enough to undergo routine dental extraction or oral surgery. Patients should have healthy gums, be committed to maintaining good oral hygiene, and have sufficient jaw bone tissue to support the titanium implant posts. The issue of bone density can be a concern for some patients, but procedures such as bone grafting and sinus lifts are available to help regenerate the tissues. If you have suffered tooth loss and would like more information about dental implants, please contact our office at 604-535-8847.